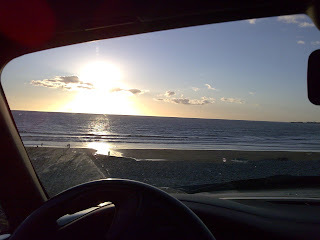 A self-drive holiday or short break in our Bongo Campervan is the perfect way to get surfing in Wales, Devon or Cornwall : small enough to get down any country lane for those secret undiscovered beaches, but big enough to sleep up to four adults and give space to relax and warm up by the beach. If you want a rest, or the surf is flat then kick back round our rear table with a hot drink or cook up a meal. For entertainment, plug your iPod into our dash stereo, or even pop a DVD on with either the dual screen (Gower) or TV (Brecon). 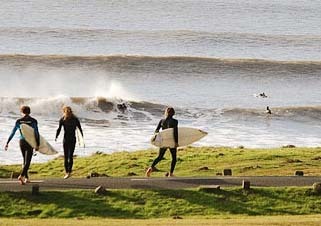 If the surf changes, or you want to try out another beach then just strap your boards on and go. The double width roof bars and a ladder make it easy to carry as many boards as you need, and we can provide waterproof seat covers. Wales has over 1000 miles of coastline to explore, including world-class surfing beaches at Whitesands Bay in Pembrokeshire, and Llangennith (Rhossili Bay) on the Gower. Take a look at some of the videos on our YouTube playlist to see what you could be doing this year. And remember Devon and Cornwall are only 2-4 hours away, with more popular destinations from Sennen Cove at Lands End, up to Croyde Bay and Woolacombe in Devon.